The Mingmen 命門 point is like the backdoor of the Dantian, whereas the Qihai氣海 point is like the front door. “Ming命” means “Life” and “Men門” means “Door” or “gate”. 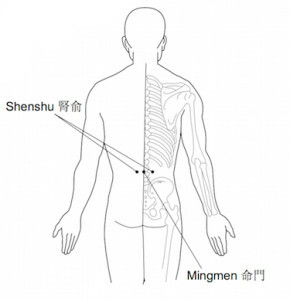 Sometimes it is used to mean style or system, for example in Chinese some people will ask, “What “men” of Kung Fu 功夫do you study?” However for Mingmen, “Men” means “Door”. So all together it means “The Door of Life”. From its name you can see how important it is. When we are younger, we should keep our back straight and when we do this you will see the spine curves in at this area, and so the Mingmen is closed. If the Mingmen is the backdoor, this should be closed. If you leave your backdoor open then it is easy for a thief to come into you home and steal your belonging. So in this case it will be easy for you to lose you Qi. When your back is straight, your Qi will stay in, and when the back is bent, so opening the Mingmen, the Qi will release out. Older people often have a deformed back which is bent. If they can keep their back straight then their Qi will be stronger. 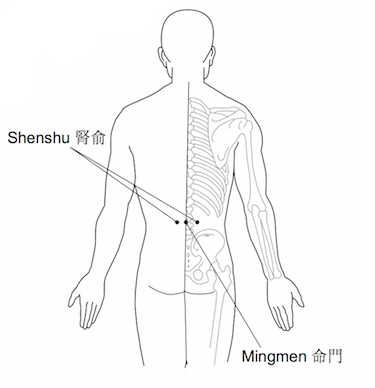 The Mingmen point relates to the kidneys and the kidneys relate to our Qi and reproductive energy. It also relates to our eyes and so if the spirit in our eyes is weak, then our kidneys are weak as well. In Chinese medicine, the kidneys are the most important organ because they create or Qi and strong Qi will allow us to live longer.